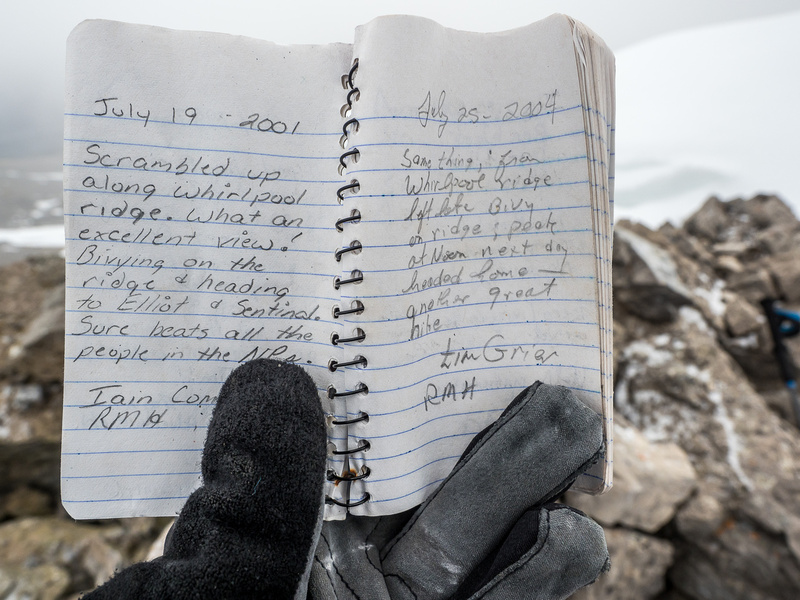 Difficulty Notes: Some exposure on the ridge leading to the highest point north of the ridge. Much easier to the lower south summit than the higher north one. 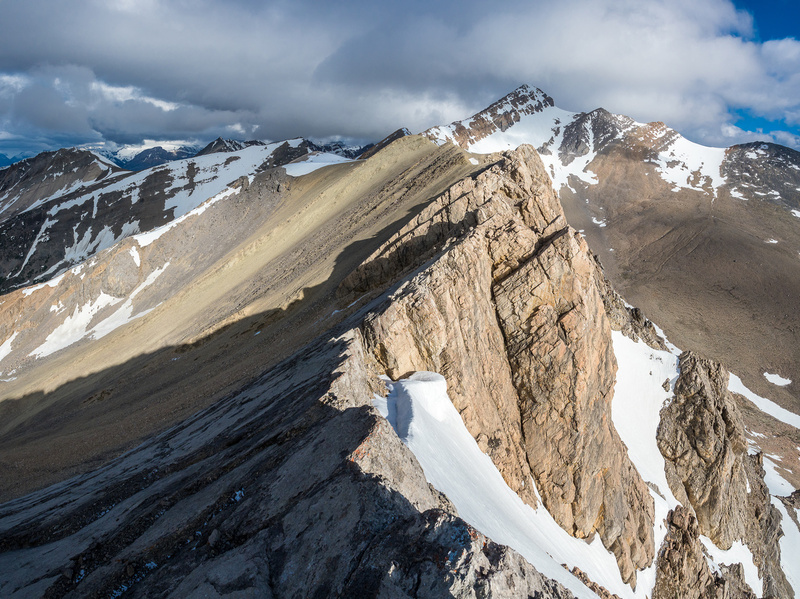 After coming so close to its summit the day before after a traverse from Tuff Puff, I knew I was coming back immediately to make a second attempt at Whirlpool Ridge’s highest summit the very next day. 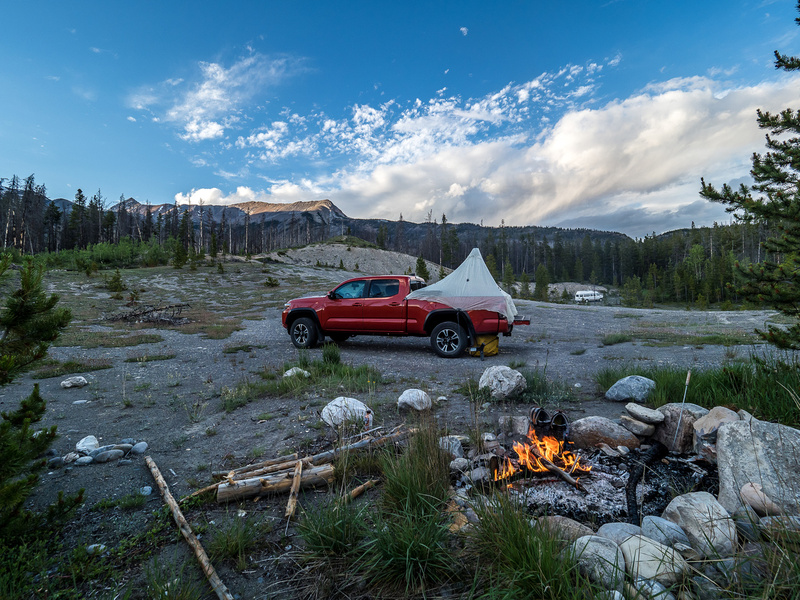 I enjoyed a delightful (free) camp along hwy 11 the evening before, setting up my mid on the back of my truck for the first time, which worked out great. The only fly in the ointment was repeated gunfire nearby, throughout the evening which kept me up until around 11pm when darkness finally started settling in! The joys of camping outside of a park I suppose. 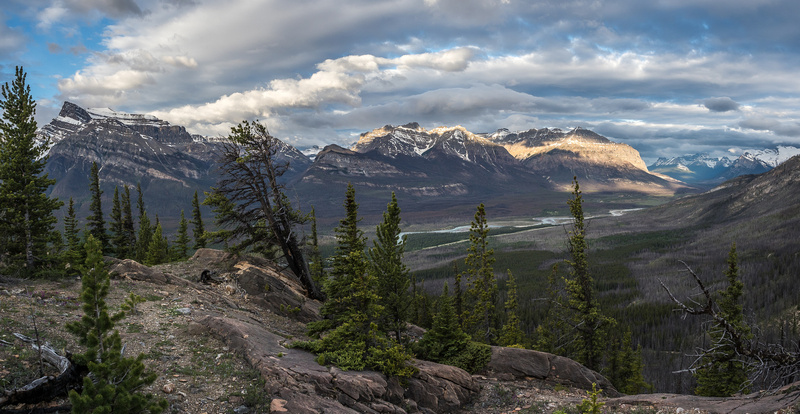 Another view of my random camp site with Whirlpool Ridge catching dying light in the distance. The route goes from extreme right – out of sight – to the highpoint at left. 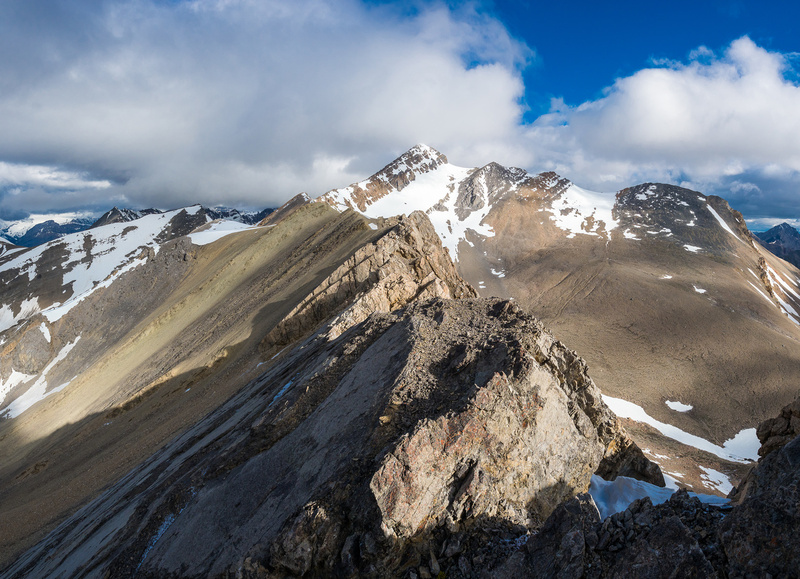 Once I gained height to the ridge, the route was obvious despite the odd cairn and trail marking the way. 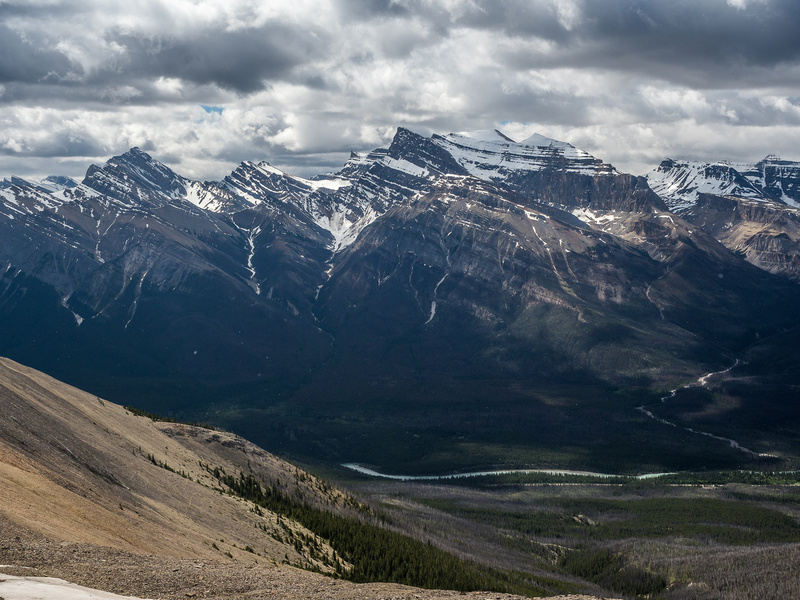 Sticking as close to the ridge crest as possible was where I found the best terrain. Any time I deviated off, I immediately came back to the crest. This theme would continue for the rest of the day. On the ridge, looking back at Peskett. 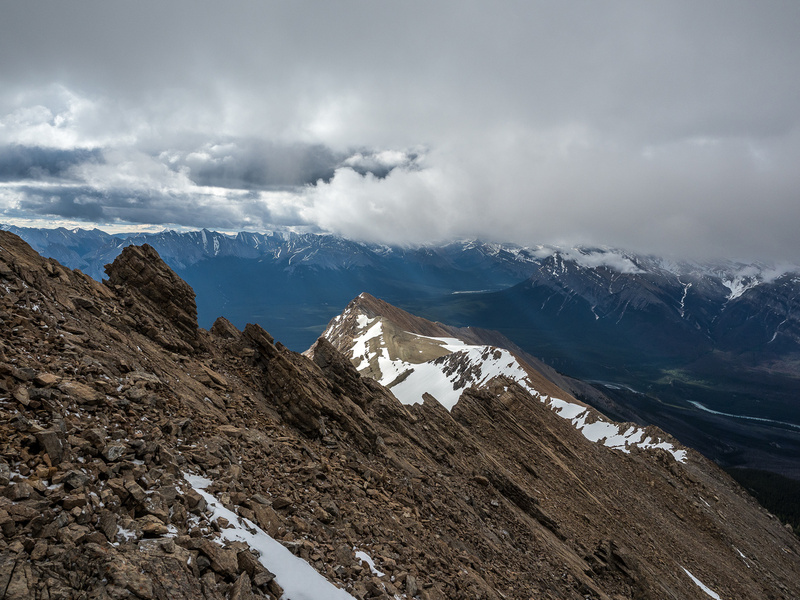 The weather was ominous as I approached the first crux to what I now think is the summit of “Whirlpool Ridge” as defined in a popular local hiking guide. This is consistent with the theme for DTC, where often the ridges are named at their lowest point (i.e. Two O’Clock Ridge), rather than their highest (Two O’Clock Peak). Which is kind of weird IMHO. The first crux of the day, after getting onto the ridge proper, is ascending slabby terrain to the upper ridge and first summit. You have two choices. Bob chose the easier route, skirting the base of the slabs on scree, but ironically he missed out on the summit of the ridge by doing this! I decided to take advantage of the dry rock and ascended the slabs directly. Once again, I had decided to wear my heavy boots since I brought the crampons just in case there was hard snow near the summit. I wished I had my lighter shoes for the slabs, but there was nothing more than moderate scrambling at most here. 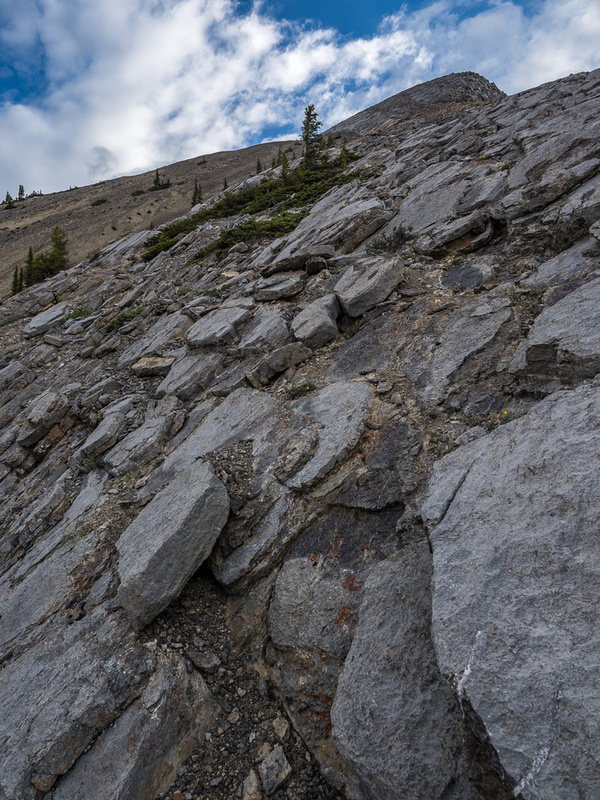 Where the slabs steepened near the top, some folks might start to feel the exposure a bit and some won’t like the pebbles that conspire to make things a bit more interesting. 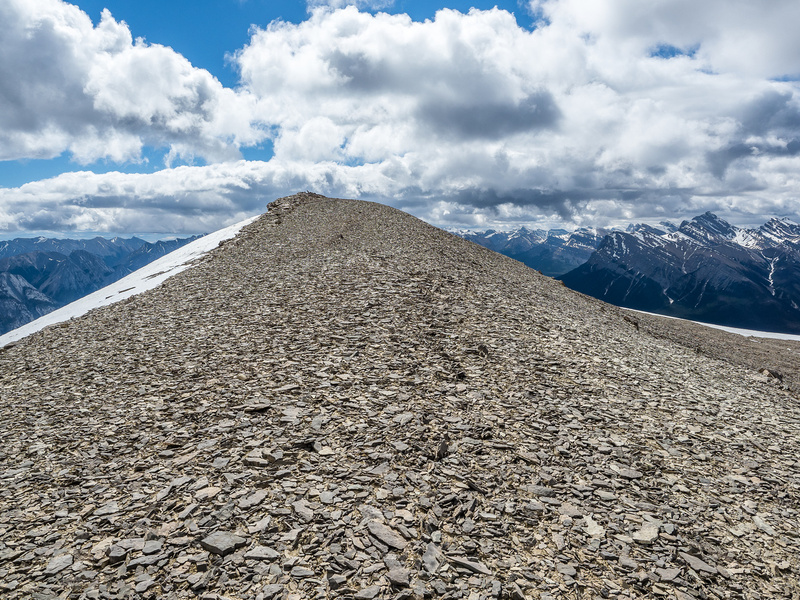 To avoid the slabs and still make the summit of the ridge, simply follow Bob’s route and then loop back right (south) when you reach the ridge crest to find the summit cairn / register. 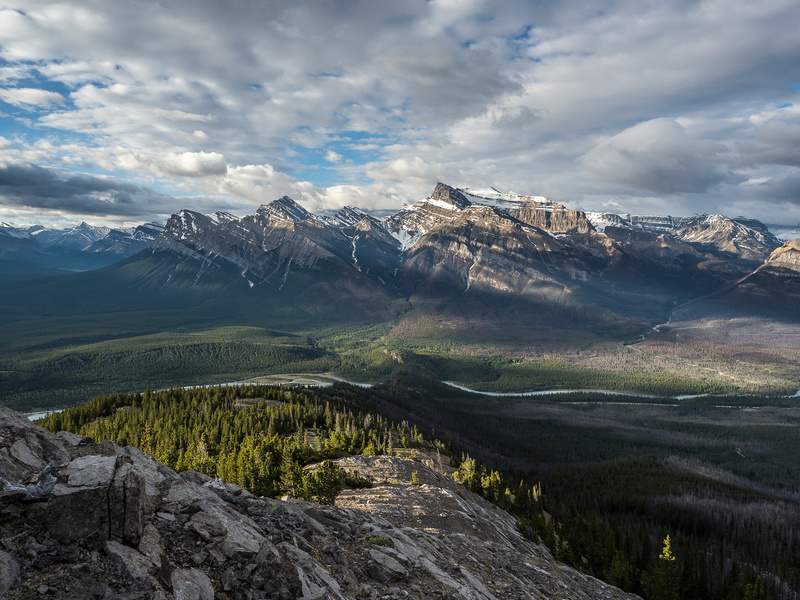 An impressive view towards the Siffleur Wilderness Area. From L to R, Cheshire, Heinrich, Siffleur, Loudon, Peskett, Marmota, Spreading and Corona Ridge. 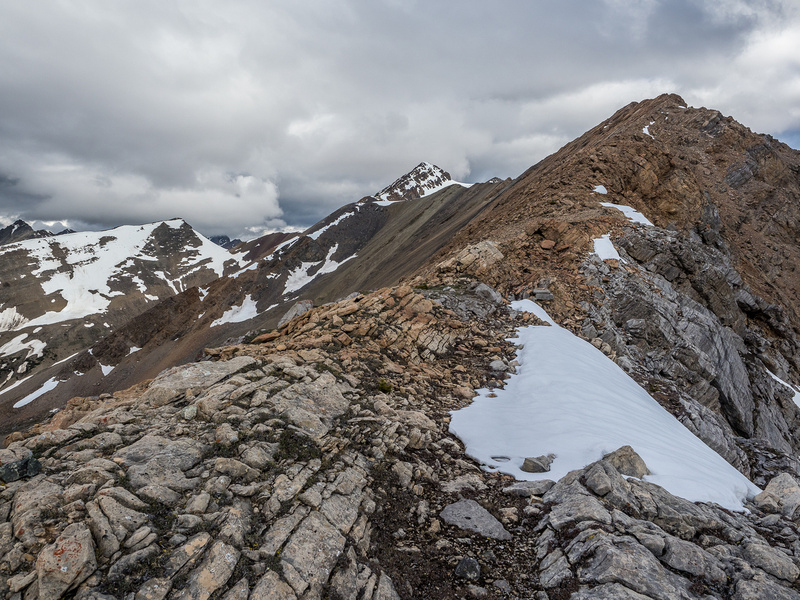 I’d seen the cairn the day before while descending Tuff Puff, so that didn’t surprise me, but the register inside the cairn did surprise me a bit, as it indicated that this was likely considered the “summit” of the ridge. 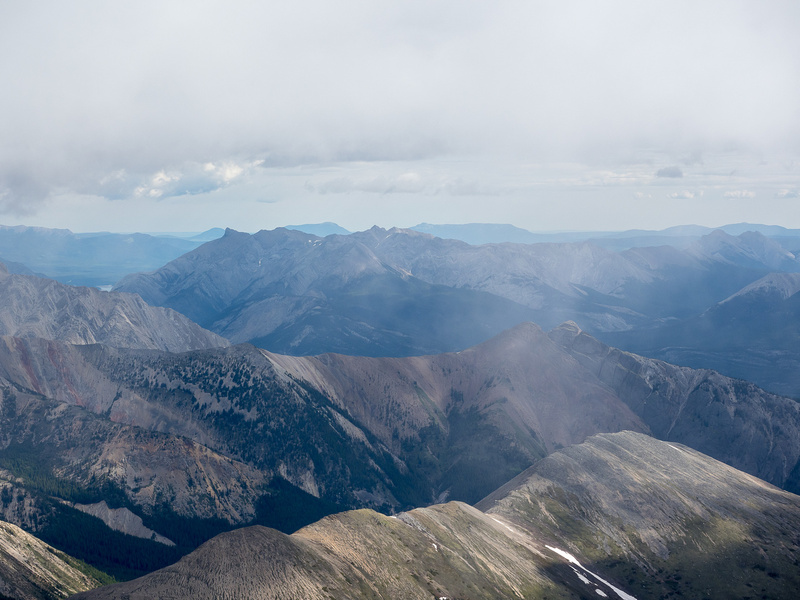 I was certainly going to tag the high point to the north, no matter if it was considered an official or unofficial summit, so after snapping some great shots (despite the clouds), I turned around and continued north along the initially wide ridge crest. The clouds sucked a bit but the lack of wind was pretty welcome on the ridge. As I walked towards the summit, I noted that it was still 500 vertical meters and over 3km away. This wasn’t going to be a fast traverse but thankfully it did look like a fun one. Entering the crux section. Note the slab at left and exposure at right. For the most part, sticking right to the ridge crest worked best. Sometimes I even deviated to the right side, despite looking sheer, it’s not everywhere. 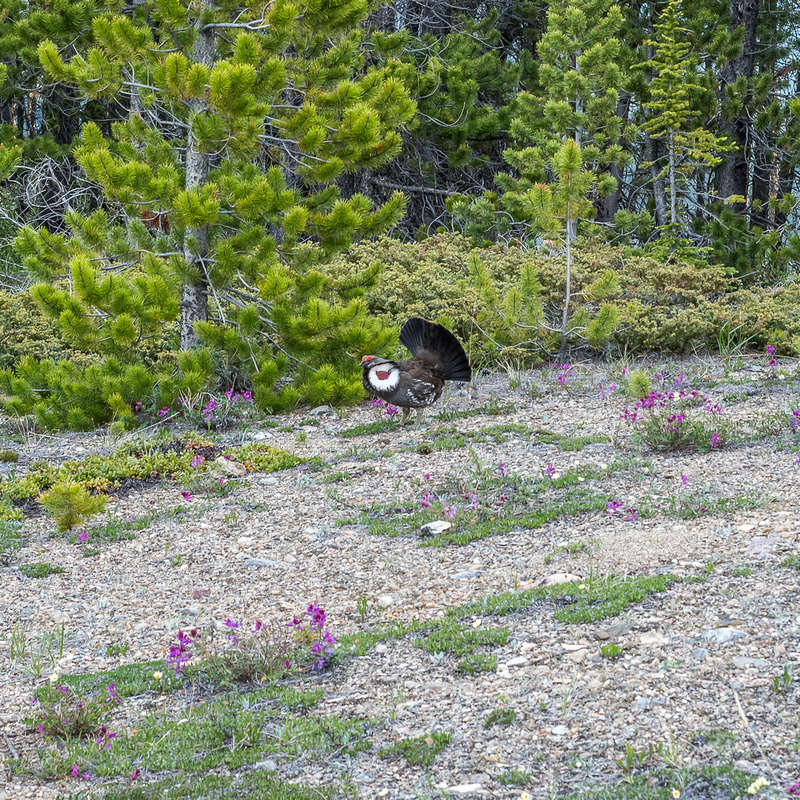 As usual with ridge traverses, and especially in this area of the Rockies, there were some hidden surprises along the way. 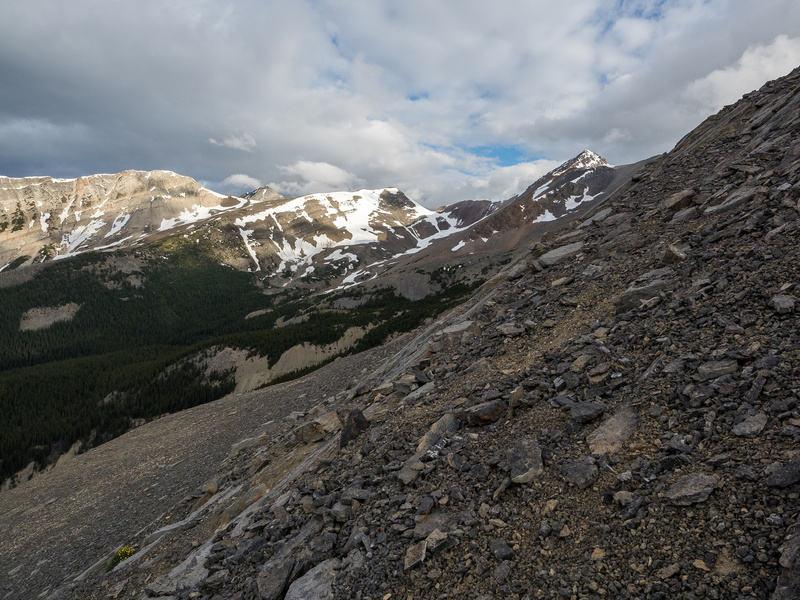 I managed to bypass the center peak on a nice series of ledges and scree ramps which saved me some time and elevation but it was the section after this that threw an obstacle at me in the form of a short section of narrow and exposed rock. 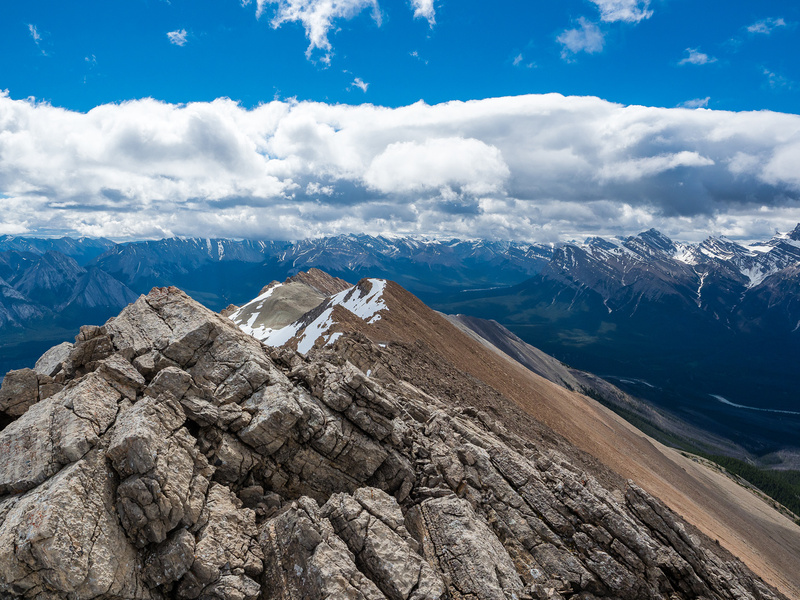 Once again, each time I tried descending off the crest, I’d quickly run into slabs or other problems – the best place to be was right on top of the ridge, so that’s where I tried to stay. One section reminded me of Lady MacDonald, not too bad with a good hand line along the ridge crest, but a slip to either direction would kill or at least cause unwanted issues in your life. I can only remember one small section of ridge where I had no choice but descend a bit to my left (west) before re-ascending to the ridge crest, thanks to a drop off that went a bit beyond scrambling. 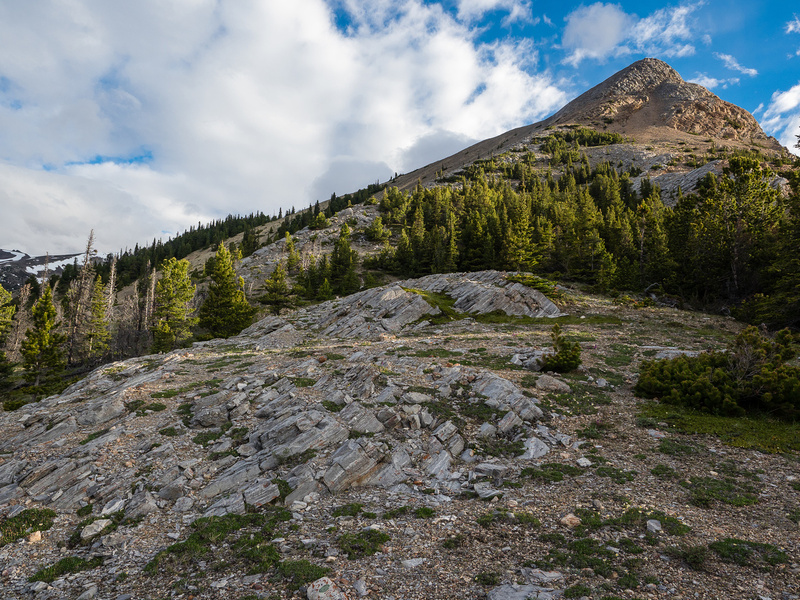 I would call the scrambling “upper moderate” – not quite “difficult” but maybe close in short sections. I loved it. 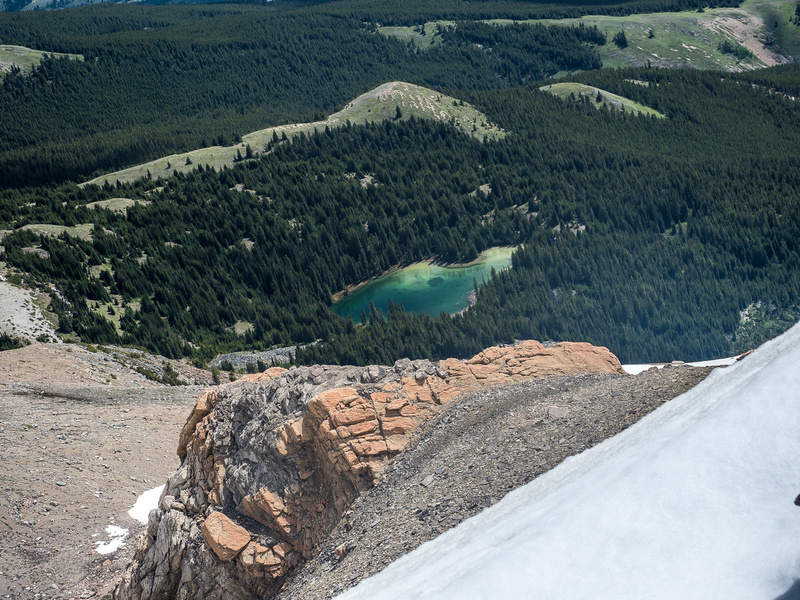 I can’t stress enough – stay on the ridge if possible, even if it looks hard. There’s even some bypasses on the east side that you won’t see if you’re not right on the ridge as you’ll think it’s all cliffs on that side. 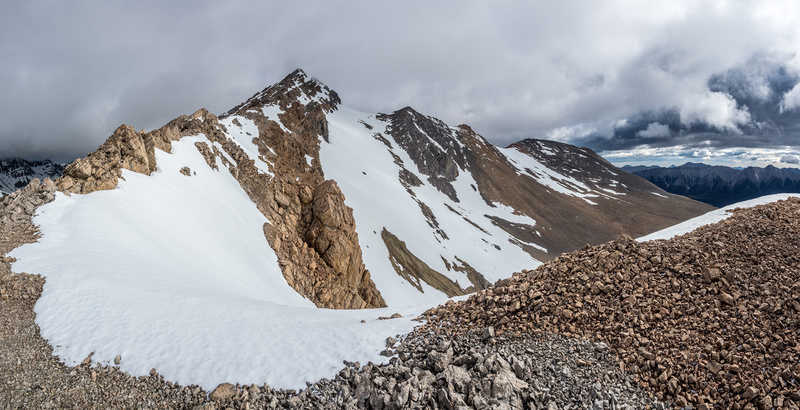 A view back over the crux section towards the center summit. The final slog to the top. 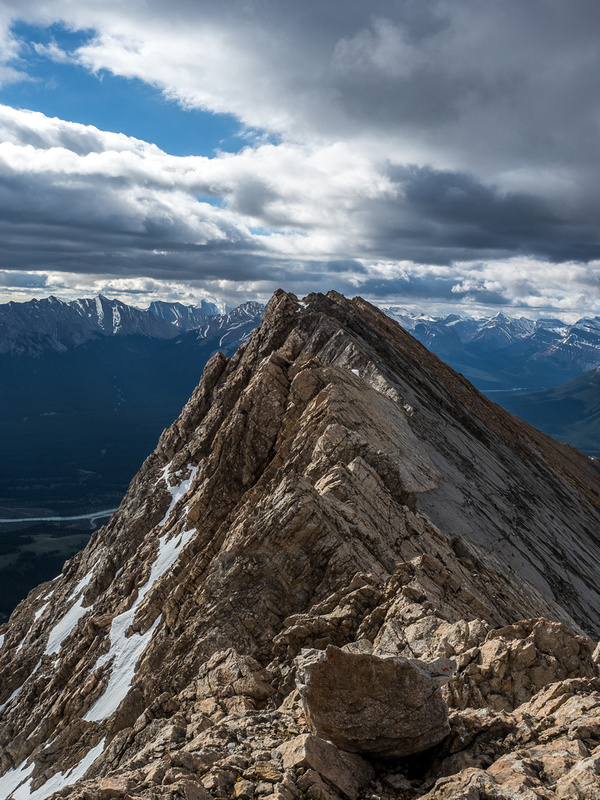 After the crux section between the center high point and the summit, I enjoyed a few hundred meters of hiking along a wide and easy ridge, before tackling the summit block. 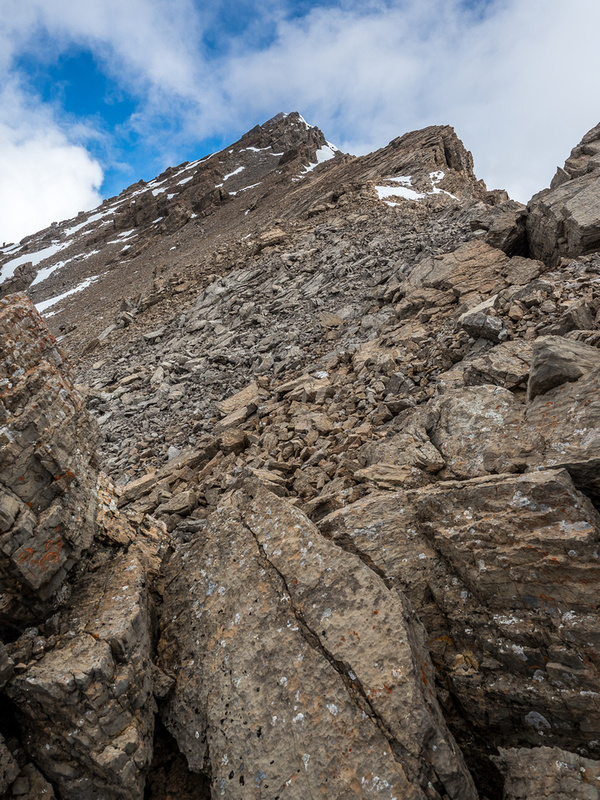 Again – the scrambling was mostly easy up this section, with maybe a few steps of moderate moves. With careful route finding the terrain was pretty tame. I was delighted to finally make the summit but a bit annoyed at the thick clouds which prevented 360 degree views. Oh well. I’d seen most of the views already – remember I was 30m below this point the day before! I have to visit the lovely Landslide Lake someday soon. It was nice to finally confirm to myself that Whirlpool is indeed a scramble via the south ridge. And guess what? Another register was buried very firmly in the cairn! Hmmm. When I opened it, I noticed that it was labeled as “unnamed”. Not very unique or creative IMHO. The group the day before hadn’t even signed it – but it was difficult to find and dig out of the register so I’m not surprised. I waited for a few minutes for the clouds to clear and only had limited success – better than nothing though. I was getting chilled in the stiff winds from the northwest and some of the clouds looked pretty ominous so I tucked tail and started back down. Ducking the clouds as I start my descent. The sky clears nicely as I descend back towards hwy 11. 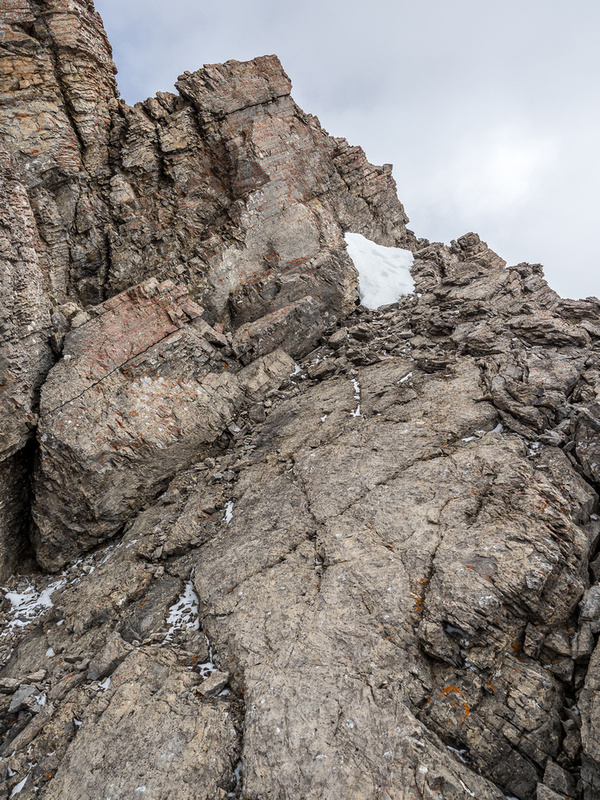 While I was descending an easy bump before the crux section of the ridge, I noticed two things that I liked. 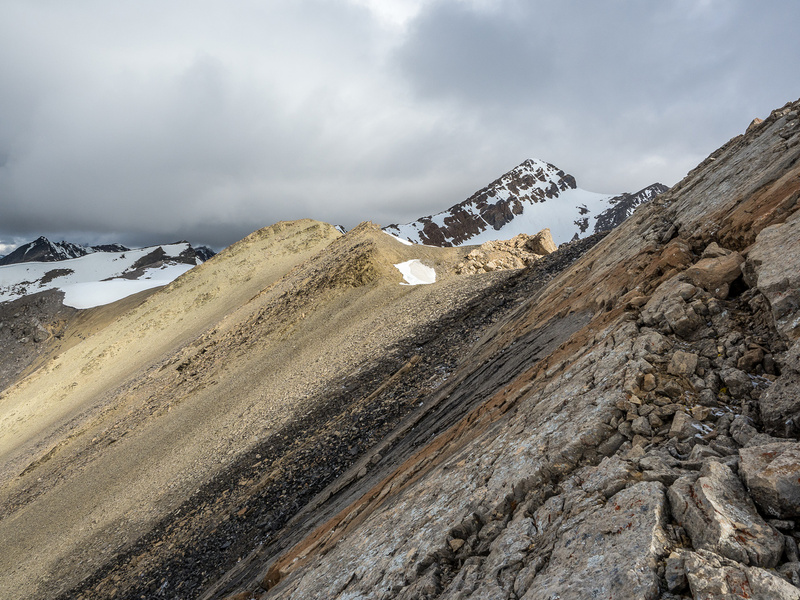 I noticed a huge scree gully leading directly down, all the way back to treeline below me and a sheep track leading along the bottom of the west aspect of the ridge just above treeline, looking to intersect with my morning ascent line up the end of the south ridge. Perfect! I love when there’s a harder route up than down. 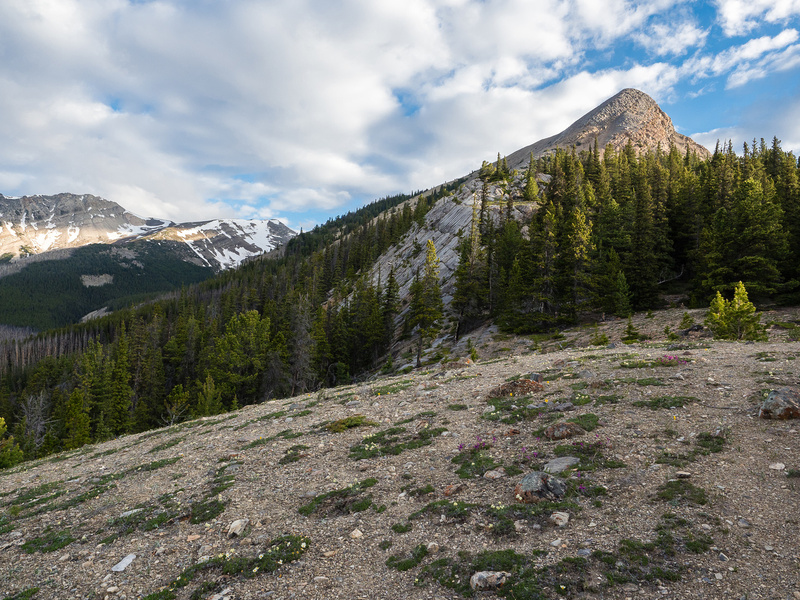 Taking a bit of a risk, since I had no idea what the route would be like, I plunge-stepped my way quickly down the loose scree gully and started seeking out sheep trails along the bottom of the west face of loose scree and slabs. It was mostly good news. 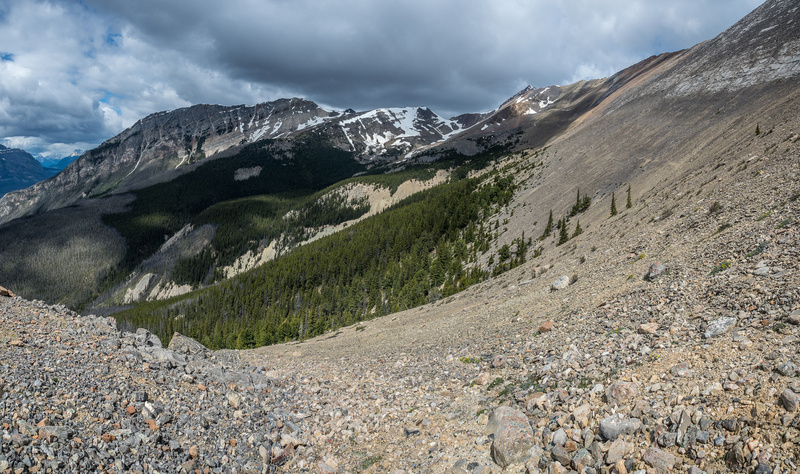 After hundreds of Rockies peaks, I have a pretty good sheep trail “radar” and I managed to find good trails for about 75% of the traverse. There were a few short sections of annoyingly loose terrain with some steep gullies that had to be negotiated along the way. Overall the alternate descent worked very well – I highly recommend it if you are good at finding sheep trails. Looking ahead to the crux section of the ridge and noticing a very enticing scree run down to the right which I eventually took advantage of. As the sky cleared behind me (of course right?! 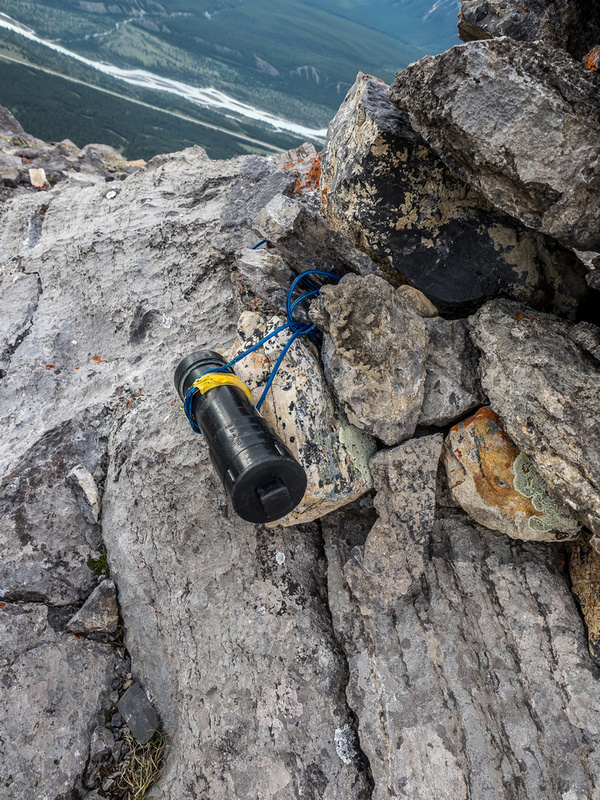 ), I joined my morning ascent path and made it the rest of the way down the south ridge to my parking spot at Whirlpool Point. My round trip time of just under 8 hours left me with a very relaxing afternoon at my random camping spot where I read lots of Stephen King, Yuval Noah Harari and planned out my next day. 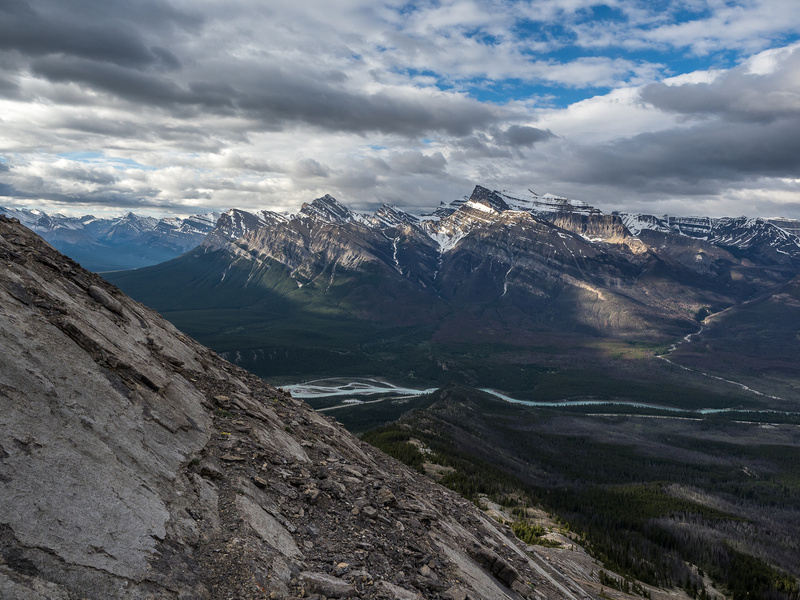 I highly recommend this moderate scramble – which might even grant you two peaks depending on your definition. 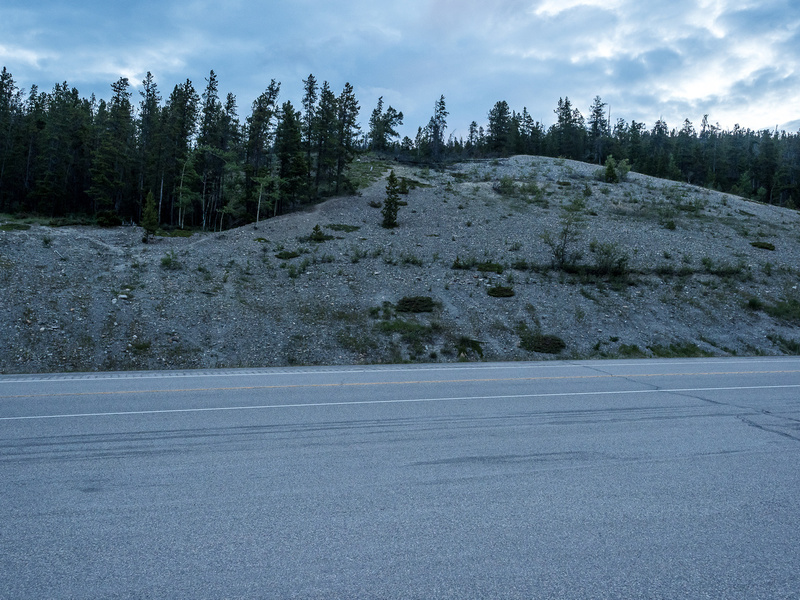 The approach is short and easy, the terrain is interesting and varied, the views are stunning in every direction and it has an easy alternate descent route. What more could you want out of a scramble? 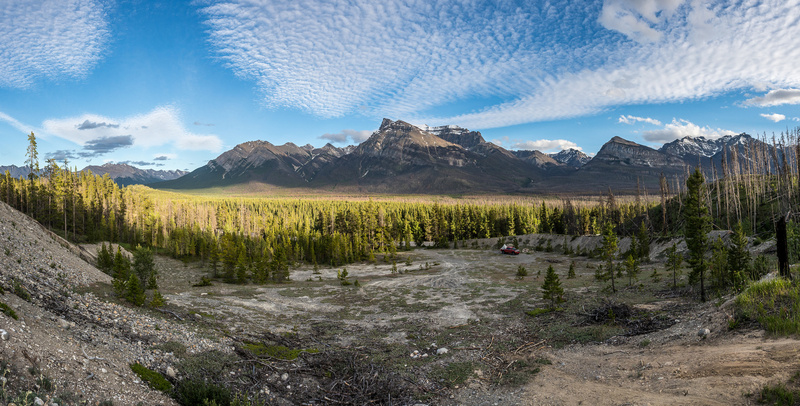 Another view of my random camp site with Whirlpool Ridge catching dying light in the distance. The route goes from extreme right - out of sight - to the highpoint at left. I simply bashed my way up this berm directly north of the Whirlpool Point viewpoint along hwy 11 and followed faint trails and Bob's return GPS track. Very early morning - around 05:30 - as I look back over hwy 11 and the Whirlpool Point viewpoint. 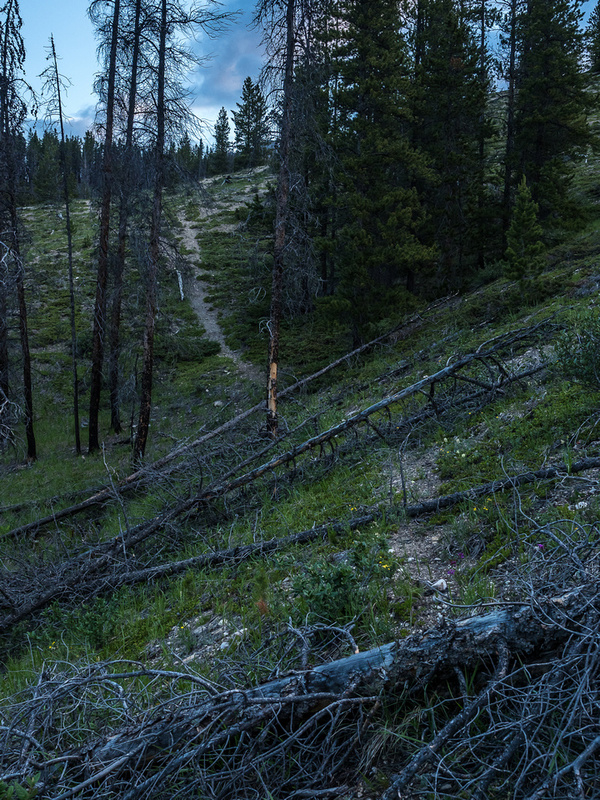 There are a lot of trails in the first kilometer or so. They vary between obvious to fading out. 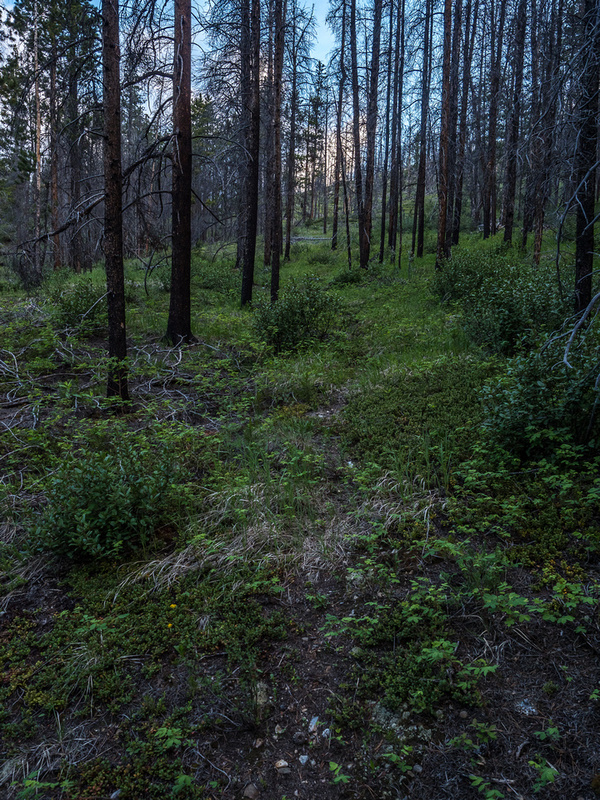 A faint section of the lower trail. 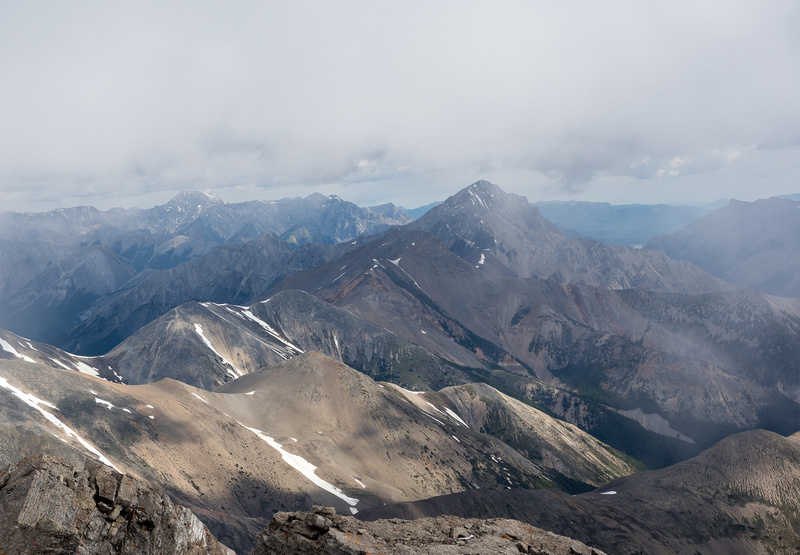 On the ridge, looking back at Peskett (L) and Corona Ridge (R). A local resident gets annoyed with me. Looking ahead to the first summit. Great morning lighting as I glance back down my approach ridge towards Siffleur, Loudon, Peskett and Corona Ridge. Lower down the slabs are easy and much better than the scree to the left. Another view back down the ridge from a bit higher up. Bob stayed left here, while I veered a bit to the right in order to avoid scree. Whirlpool's north summit is visible at distant right. Getting more slabby now as I look back towards Peskett. 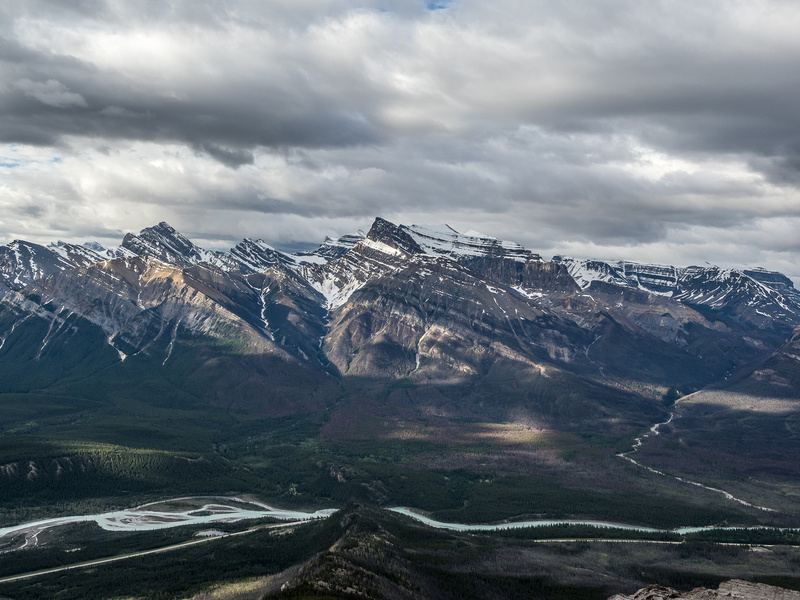 You can see where the North Saskatchewan River cut through the ridge at lower center. 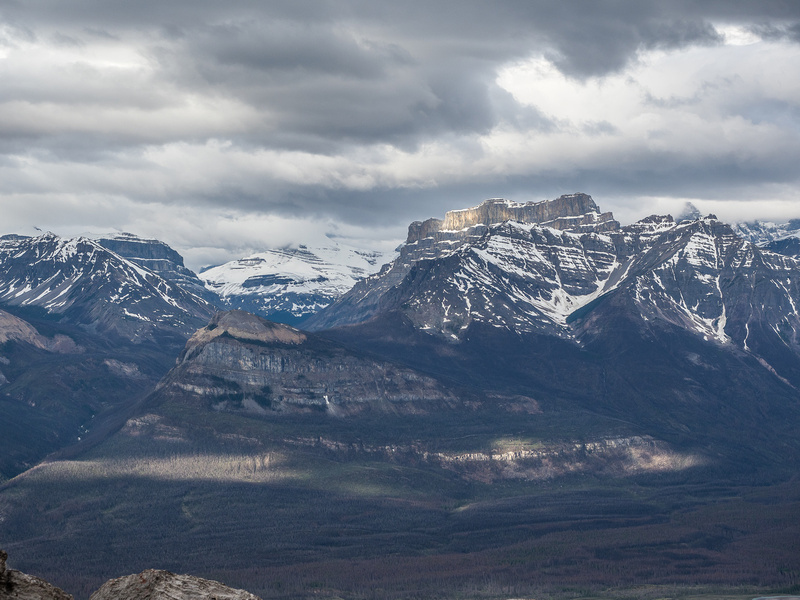 Great views south off Whirlpool Ridge. Elliot and Ernest Ross in the background with Tuff Puff in front. Michener at distant right. A long way to the north peak from here. Corona Ridge (R) is an impressive hunk of Rockies real estate. The summit cairn on Whirlpool Ridge with William Booth and the Ex Coelis group beyond. 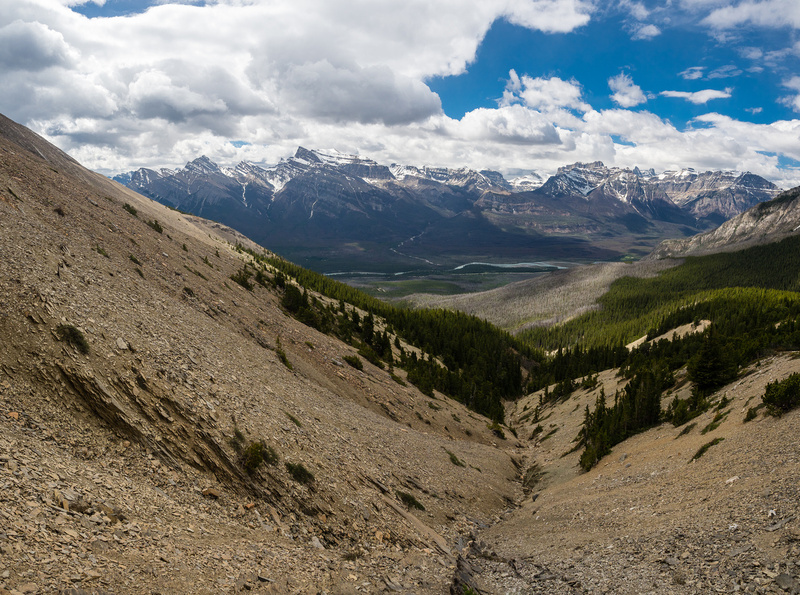 An impressive view towards the Siffleur Wilderness Area. 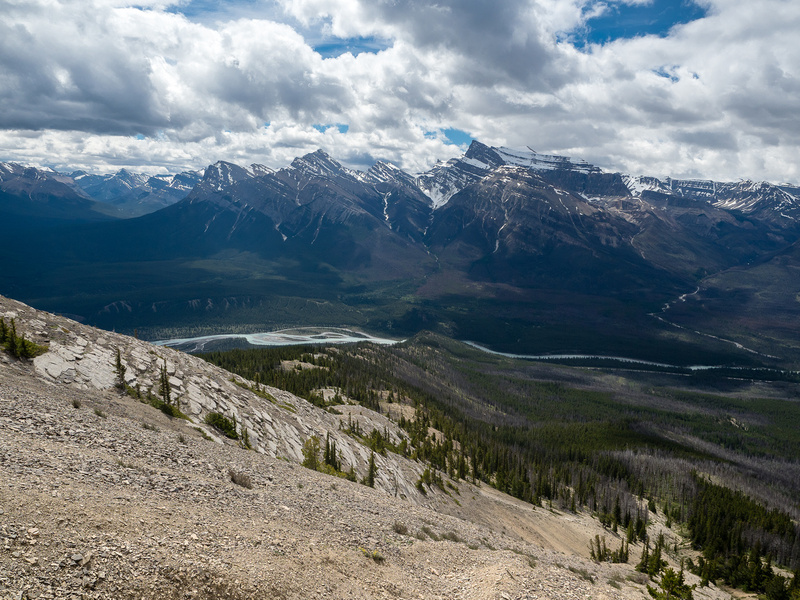 Looking directly across the North Saskatchewan River, note how the river cuts right through the lower ridge. Continuing along the broad ridge. Starting up the center peak. I went part way up and then found a nice bypass which saved me some time and energy. 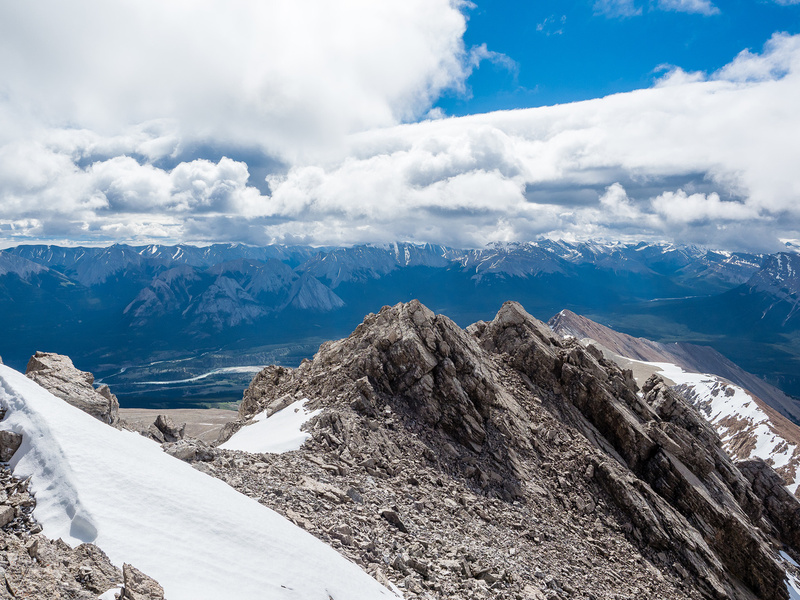 Gorgeous views back along the ridge over the first summit. Entering the crux section. Note the slab at left and exposure at right. For the most part, sticking right to the ridge crest worked best. More exposure - much steeper to the left than this photo shows but solid and no more than moderate scrambling. Looking back up the crux section. Note the slabs that are hard to bypass without going way down to the right here. A window along the ridge. 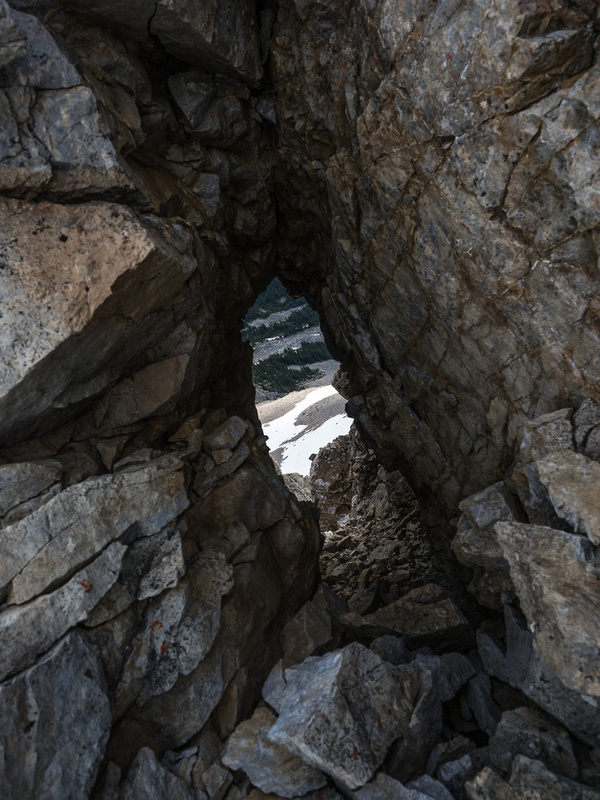 A rare case where I descended around an obstacle on the ridge crest - I found this nice crack to descend. 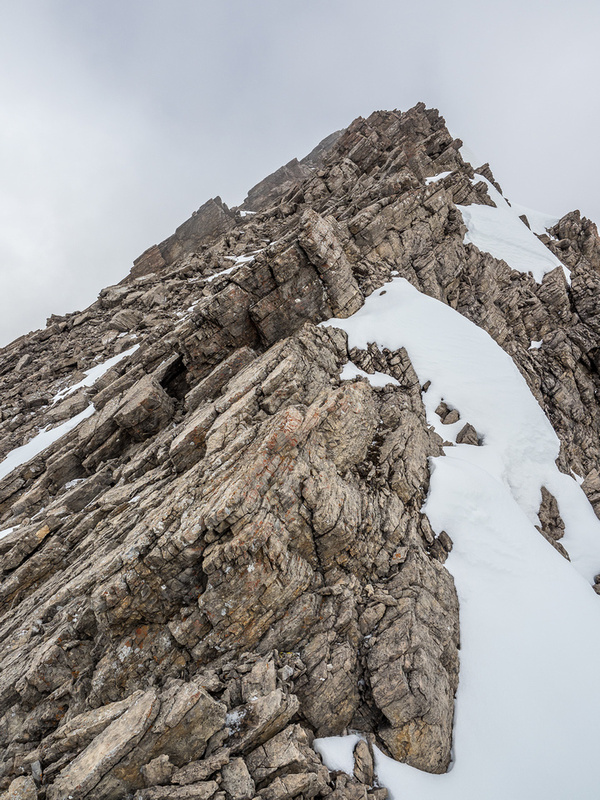 I traversed the crack in the slab ahead before continuing on the ridge to the summit which was getting cloudier by the minute. Another view back along the ridge with the crux section between me and the red colored middle peak. The rest of the way looks fairly straightforward but the thickening clouds are starting to annoy me a bit. Some care is required on the loose terrain but this is pretty easy stuff. 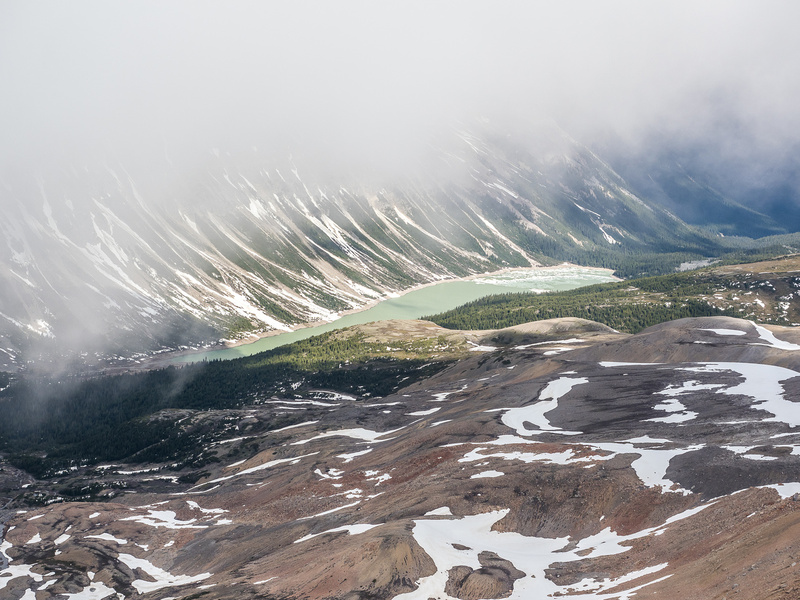 Very brief and limited view from the summit of Whirlpool looking north over Landslide Lake (L) and towards Two O'Clock Peak. I have to visit the lovely Landslide Lake some day soon. A 20 year-old register. I'm a bit confused by the entry though - as this certainly is NOT Mount Ernest Ross. Some folks do a traverse from Whirlpool to Elliot / Sentinel which would be pretty cool. 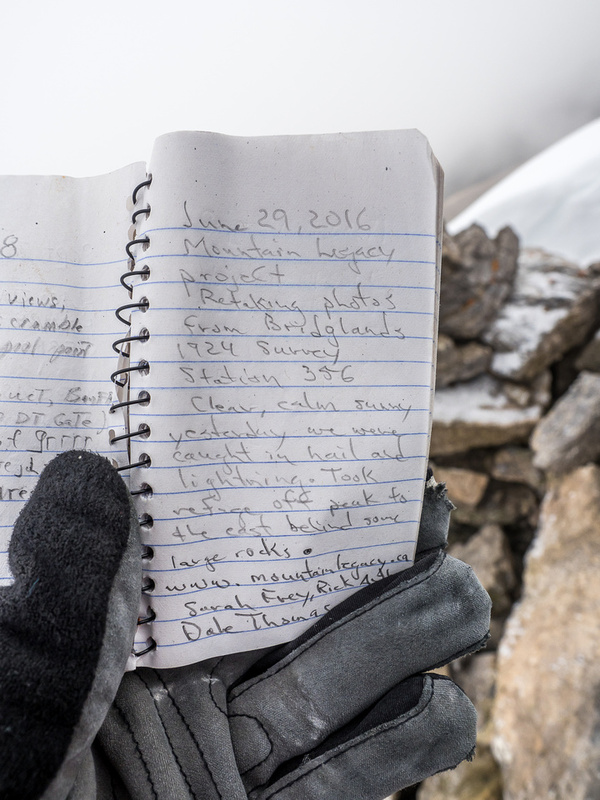 Only recorded ascent last year despite there being two back-to-back summit parties already in 2017. Allstones and Abraham in the far distant left with Elliot rising impressively at center over Bridge Peak. Two O'Clock Ridge and Ernest Ross are tiny bumps. Michener shows why it has an alternate name at distant left. Some moderate scrambling down from the summit. Great wild scenery along the ridge. Off the summit block and traversing a very wide and easy section of ridge before the crux section. Looking back at the clearing (!!) 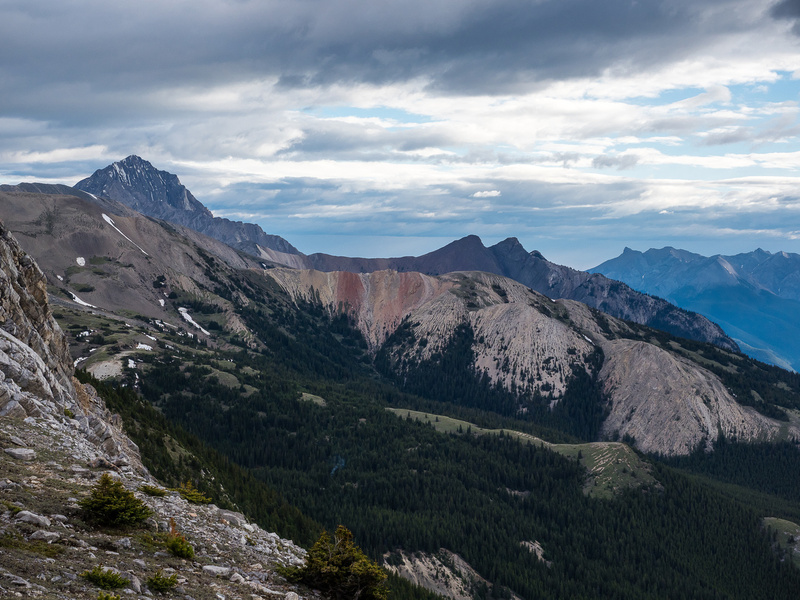 summit (L) and down into the bowl between Whirlpool Ridge and Tuff Puff where the lovely Kinglet Lake is nestled. 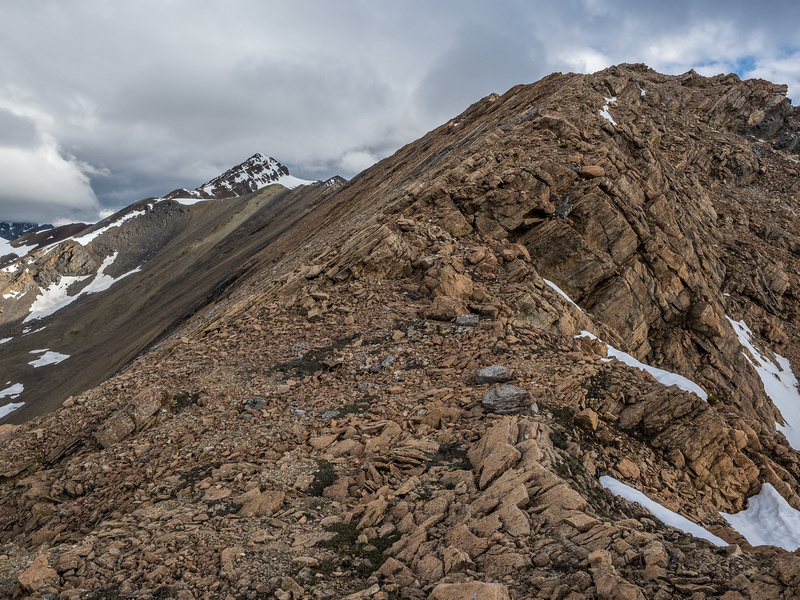 Looking ahead to the crux section of the ridge and noticing a very enticing scree run down to the right. My descent route starts here. If you look carefully you can spot sheep trails at lower left. 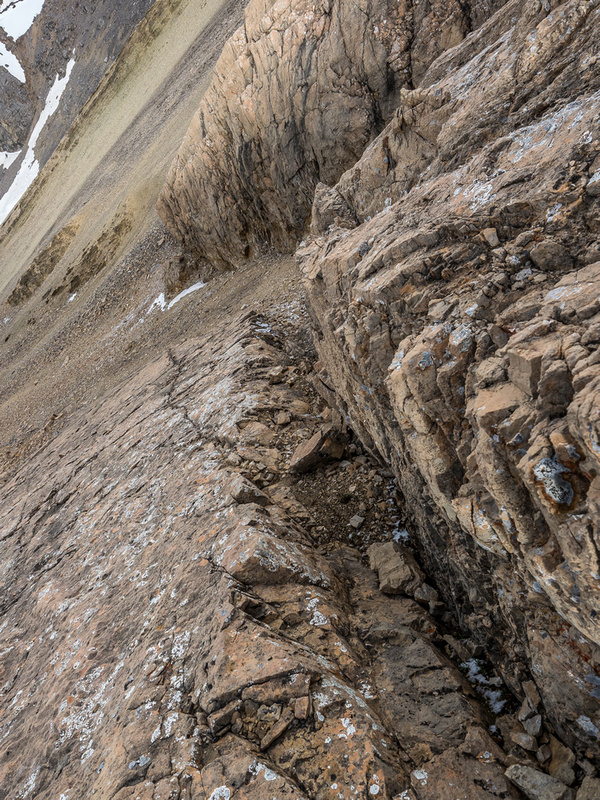 There were a few annoyingly steep / hardpack gullies on my traverse but nothing too dramatic. 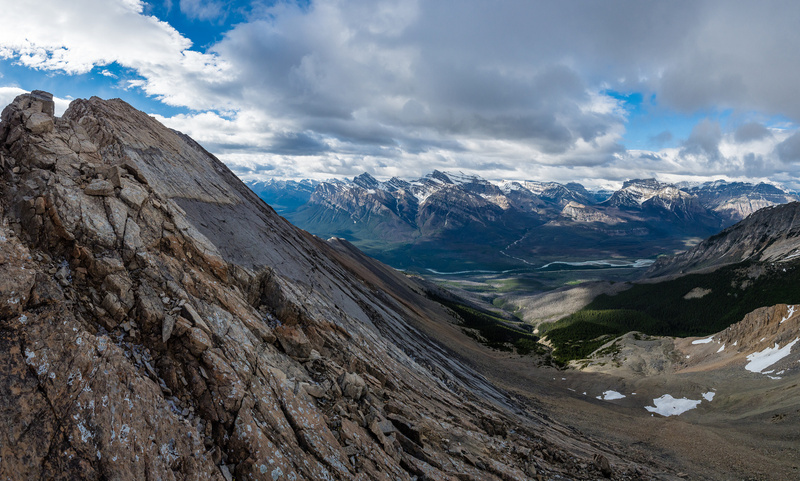 Looking back along my traverse to the summit of Whirlpool. Note the slabs at right that have been completely stripped of scree. My ascent ridge visible, I know my alternate descent will work out fine. Easy hiking all the way back to the truck. Thankfully there were no more gunshots that evening, but 3 teenagers who decided to rip around my camp site in their beater car did get arrested in front of me by law enforcement officials. I’m sure they were in a heckuva pickle by the time they were finally driven off with their car towed! They must have been high or drunk or both. Never a dull moment in DTC apparently. It was at this time that I chatted for a bit with one of the arresting officers and confirmed that I could, indeed random camp there.